New: Tuesday brings the launch of Axios Space, a weekly newsletter covering the latest in the trends, business and science of space. Thanks to the reader who helped me locate my jet-lagged brain. It was apparently somewhere in Newfoundland. Good I found it as there was lots of news Tuesday. As nationalism rises around the world, globally minded tech companies are finding their businesses increasingly hemmed in by association with their home countries. The big picture: The bonds of international trade that for decades were viewed as a key driver of economic growth are instead coming to be seen as national security risks — by the U.S. as well as many of its trading partners. The U.S. has long raised questions about Chinese companies, especially Huawei and ZTE, over espionage risks. Objections over Huawei, in particular, have increased, with the U.S. bringing criminal charges against both the company and top executives. National security concerns have also surfaced over U.S. companies acquired by Chinese entities, such as gay dating site Grindr. Russia's Kaspersky Lab is trying to overturn a ban on federal purchases of its software in the U.S.
U.S. companies can face similar concerns abroad, especially in Europe, where both security and antitrust concerns have been raised about U.S. tech companies. Between the lines: U.S. policymakers often argue that fragile laws in countries like China and Russia won't protect companies' customers, data, and intellectual property from demands made by authoritarian governments — and there's plenty of evidence and examples to support that view. The Snowden revelations about NSA surveillance showed how closely U.S. tech firms work with their own government. Facebook's Cambridge Analytica scandal showed how poorly some U.S. firms protect their users' data. That has left American companies facing an uphill battle to claim high ground in this realm. Context: Judging companies on where they're based and what motives they might have beyond commercial interests is part of a larger shift in thinking, says Robert D. Atkinson, president of the Information Technology and Innovation Foundation. "We went through about a 20-year idealistic period where the ‘One Worlders’ believed everything would be this one giant global market with massive free trade and everything will be great," Atkinson said. "It turns out that’s a myth. Really what we have now are competing blocs." Sen. Marco Rubio (R-Fla.) told Axios in a statement that Chinese companies should be viewed as agents of the state. "In China, companies like Huawei and Hikvision willingly advance the authoritarian regime’s goals, yet here in America, we can’t even get Apple to crack open an iPhone for the FBI to investigate a terrorist attack." In a Washington Post op-ed, Sens. John Cornyn and Tom Cotton made the case for keeping China out of 5G networks in Europe. Laura Rosenberger, director of the Alliance for Securing Democracy, said the controversies are about more than just the location of a company's headquarters. 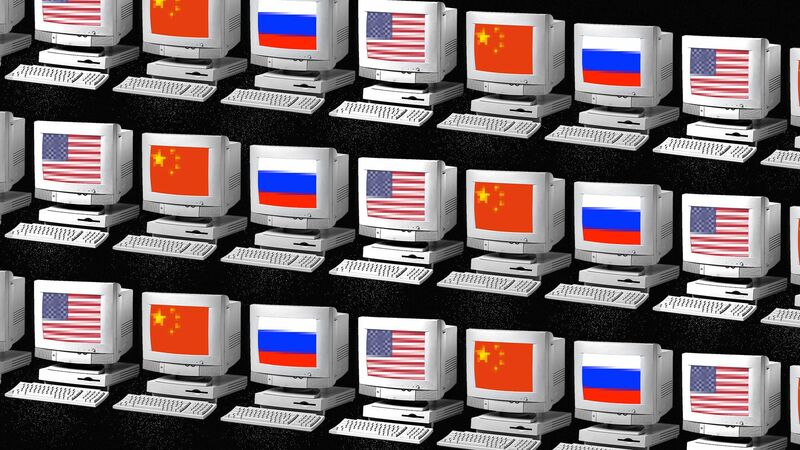 "I don’t think it’s that companies should be viewed based on their home countries, but rather that ... those companies’ relationships with the state and the laws that govern them are important to understand and — in the case of Kaspersky, Huawei and ZTE — have direct implications for national security." In attempting to verify the identity of some new users, Facebook confirmed yesterday it had been using a particularly troubling tactic: asking them to provide their email password. As I first reported yesterday, Facebook said it was stopping the practice. Nonetheless, the response on social media was unified incredulity that Facebook had ever thought this practice was a good idea. That was my reaction as well, with the note I sent to Facebook inquiring about the practice headed "Is Facebook really doing this?" The Daily Beast, which first reported the issue, called the technique "beyond sketchy." Why it matters: Although Facebook says it never stored the passwords, collecting them in the first place is a bad security practice, both for the risk of a breach and for conditioning users to provide information they should protect. Those being asked for their email passwords were users who listed an email address that doesn't use the secure OAuth protocol, which allows users to verify their identity to a third party without sharing their passwords. Flashback: Facebook recently acknowledged it had been storing some of its users' Facebook passwords in plain text. A damning report from Bloomberg yesterday alleges that top YouTube executives debated for years whether extremist viral videos on its platform were really a problem — often rejecting solutions to manage the situation — in an effort to maximize growth and profits, Axios' Sara Fischer writes. Why it matters: Tech companies have long been criticized for harboring hate on their platforms, but as the consequences of their inactions begin to unfold more visibly in the real world, companies like YouTube are facing more pressure. Driving the news: The most poignant aspect of the Bloomberg article is a narrative similar to one reported about Facebook's handling of Russian misinformation: Top executives were repeatedly briefed that there was a problem, and chose to downplay it for the sake of focusing on business outcomes. It announced Tuesday that it added a tip line for misinformation on its popular messaging service WhatsApp since the encrypted network makes it nearly impossible to track misinformation. Be smart: Calls for change have started to pick up in the wake of real-world crimes by people radicalized by hateful or conspiracy-minded content. As faithful Login readers know, last week I was in Denmark. I can now reveal part of the reason why I was there: to get a behind-the-scenes look at Spike Prime — a new product from Lego Education designed to teach coding and robotics to middle schoolers using the company's signature building bricks. Details: Spike was introduced to the world yesterday at a press conference in New York, but I had a chance to see the product in action last week and talk with Esben Stærk Jørgensen, president of Lego Education, the unit of the Danish toy giant that sells products to schools. While the ostensible goal of Spike Prime is for students working in pairs to build specific robots, the real mission is to teach students science, technology, engineering, art and math skills in a way that's fun and engaging. But Jørgensen acknowledged the bar for engaging middle schoolers is a high one. Among the initial tasks for students is to build a robot that can move without wheels. I tried my hand at this and managed a bot that could propel itself forward, albeit not very gracefully. Background: The company spent 2 years developing Spike Prime, seeking a product that was just as powerful as the company's Mindstorms line, but more accessible. Fun fact: Spike Prime also contains 11 new Lego elements, ranging from a large Technics base to new clips to bricks that help bridge the world of Lego and Technics. That's a lot for one new product and sure to have Lego diehards clamoring to get their hands on the product. Although Spike Prime is only being sold through Lego's education channel, it will be available online for individuals that really want one. Go deeper: You can learn more about Spike Prime in this video I made at Lego's headquarters in Billund, Denmark. Google said yesterday that it will require contract and temporary workers be paid at least $15 per hour and receive parental leave, health care coverage and other benefits by 2022. According to an internal memo seen by The Hill, temporary and contract workers account for 54% of Google's total workforce. Why it matters: Temporary and contract workers make up a large share of the total workforce at tech giants like Google but typically lack the salary and benefits offered to full-time employees. Google employees who walked out earlier this year were seeking broader rights for temporary and contract workers, among other changes. Okta's Oktane conference takes place this week in San Francisco. Qualcomm CFO George Davis is leaving for the same role at rival Intel. Former DNC chief technology officer Raffi Krikorian has joined Emerson Collective as a managing director. Rather than pay for its own band to travel to Ohio for the NCAA tournament, Colgate chose to pay the Ohio State pep band to play for it instead. It did not go over well.